I’ve been keeping a bucket list since I was 15. While it’s evolved a lot over the years (I recall “finish all Harry Potter books” and “wear red lipstick on a regular basis” making the first draft), that’s part of the awesome thing about bucket lists: they change as you do, and they’re ever expanding. I left my old bucket lists at home when moving to Korea, but started (yet another) new one on my phone within a few weeks of my getting one here. And since I always lose them, change them, or forget things to put on them, I figured it’s time to put it somewhere safe: the Internet. 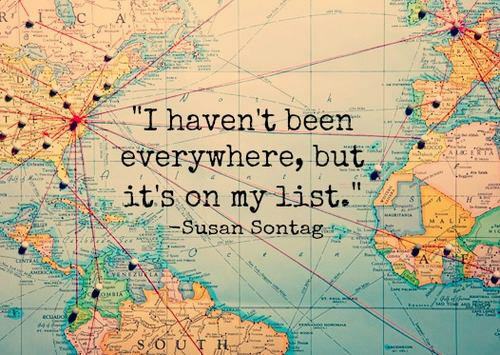 I’ve divided it into travel (by continent) and life goals/experiences. Some of these things I’ve already accomplished, but rather than chuck them from this new list altogether, what better motivation than to look back and see your accomplishments! And now on to the ambitious list! errr you can cross off Washington D.C. (remember the Smithsonian Museum, Washington Monument, Lincoln Memorial, late night chinese food supper?) and perhaps driving through Vermont to go south (not too sure ’bout that one). You forgot . . . Walk on another planet ! (my favorite). All i can say is . . . . You Go Girl ! No Vermont. We drove down through New York State. But we went through Maryland and Washington DC. Does the dogsledding in Chambly not count? I done only a handful from your incredibly daunting but inspiring bucket list. 1) Vermont (obviously): If you plan on passing through, I have some routes in mind and a time of year (basically NOW, for the foliage). And you and yours would have a place to stay if needed. 2) Cross country U.S.: I’ve been to all the lower 48, nearly all at least twice. Again I have some routes in mind and highlights, which includes the Grand Canyon, Yellowstone, a certain redwood grove, Key West, The Badlands, The Gulf Coast … but enough of that for now.